Shredder is a simple way to delete any files you no longer need in either a secure or ordinary way. Just drop them onto the module and, be sure, it will do the task even if Finder fails. By default, CleanMyMac offers to remove files in a regular, quick, and reliable way. 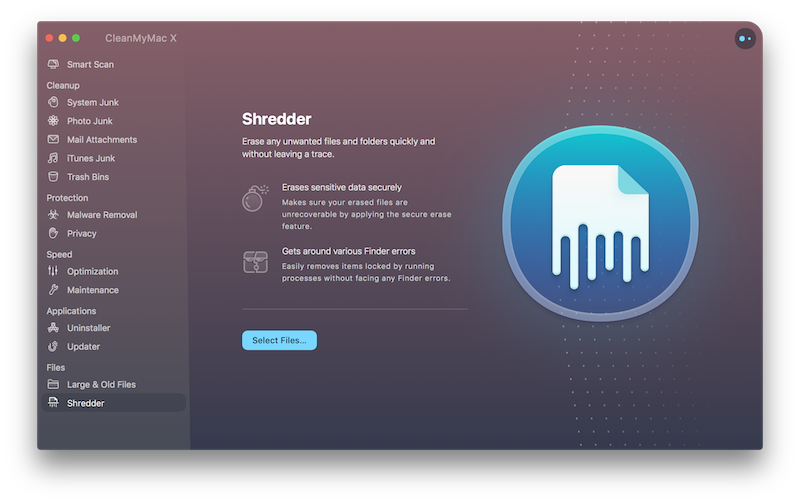 With this option, Shredder can seamlessly get around Finder errors and remove even those items that are locked by running processes. If you choose secure removal, be sure that erased files, including their digital footprints, will be made completely irrecoverable. This type of removal takes more time, but all data gets rewritten, which leaves no chance to recover to any special tools. Add items for removal: Click Select Files on Shredder's start screen or drag files or folders either directly to the CleanMyMac Dock icon or to the open CleanMyMac window. Immediate removal: A default option that removes files quickly, in an ordinary way. Secure removal: Deletes items so that they cannot be recovered with any special tools. This type of removal takes more time, but all data gets rewritten, which leaves no chance to recover. If you'd like to review and sort the largest files on your Mac, start scan in the Large & Old Files module.